Plot THE MAGIC FLUTE opens with Prince Tamino being rescued from a serpent by Ladies in the employ of the Queen of the Night. Papageno the bird-catcher arrives and claims he killed the serpent, but the outraged Ladies padlock Papageno's mouth for his lie. They also show Tamino a portrait of Princess Pamina, the Queen's kidnapped daughter, and he immediately falls in love. Protected by a golden flute, he sets off with the bird-catcher Papageno to rescue Pamina from the clutches of the sorcerer Sarastro and a madcap adventure involving magicians, wild animals and very Masonic-like trials. Triumphing over all adversity, the lovers unite, as the forces of light banish the darkness and Papageno even finds a true love of his own. 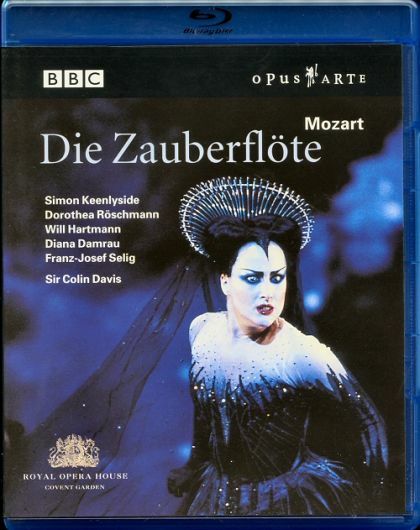 The internationally renowned Mozart interpreter Sir Colin Davis conducts the chorus and orchestra of the Royal Opera House and a glittering cast in David McVicar's 2003 production of the opera Mozart wrote in the final year of his life, recorded live at Covent Garden.